The National Fund for Entrepreneurship Support (NFES) has provided concessional loans worth 40.6 million manats ($23.8 million) since early 2017, which contributes to the implementation of about 521 projects. The Economy Ministry reported that these loans allow to create more than 1,500 new work places. Within the framework of a business forum held in the Khagani village of the Goygol district, entrepreneurs received preferential loans in the amount of 709,000 manats ($416,000). These funds will be directed to the development of livestock, beekeeping, viticulture and other areas. 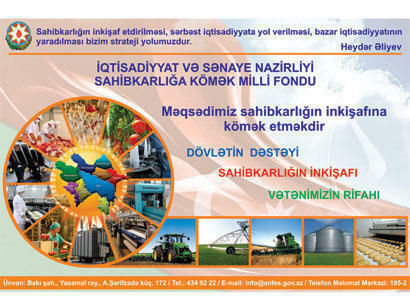 So far, entrepreneurs of the Ganja-Gazakh economic region has received preferential loans amounted to 233 million manats ($136.9 million) for the implementation of almost 6,300 investment projects, preferential loans granted to entrepreneurs from Goygol district have reached 13.6 million manats ($8 million). Some 150 million manats ($88 million) will be issued for granting preferential loans to entrepreneurs in 2017. The Fund was created in 1992 and grants loans to entrepreneurs through authorized banks and non-bank lenders. The main goal of the Fund is to provide preferential loans from the state budget for small and medium business, in order to develop entrepreneurship in the Republic of Azerbaijan.